1. Apple's big day: Apple is expected to unveil three new iPhones at a product event on Tuesday. It's been 10 years since the launch of the first iPhone. There's speculation that the anniversary edition will feature wireless charging, facial detection technology, a virtual home button and an edge-to-edge screen. The new premium iPhone is expected to cost over $1,000. Shares in Apple (AAPL) were inching higher premarket after the stock gained 1.8% on Monday. The event will start at 1:00 p.m. ET. The Apple announcements come just days before rival Samsung (SSNLF) begins selling its new Galaxy Note 8. The $929.99 smartphone is set to go on sale Friday. 2. North Korea response? : Investors are monitoring North Korea after the United Nations Security Council unanimously agreed on Monday to impose new sanctions on the rogue state. The move comes just one week after Pyongyang carried out its sixth and largest nuclear test. The U.N. resolution aims to cap North Korea's oil imports, ban textile exports and suppress smuggling, among other things. U.S. Treasury Secretary Steven Mnuchin may discussion the sanctions at a CNBC conference on Tuesday. 3. Global market overview: U.S. stock futures were edging up on Tuesday. 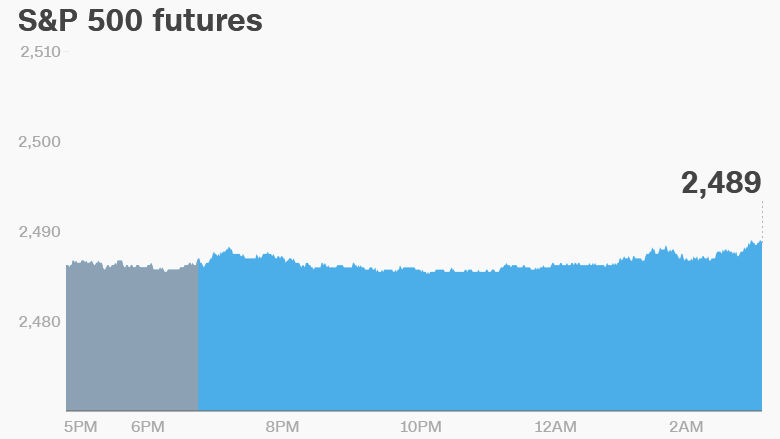 The Dow Jones industrial average, S&P 500 and Nasdaq all surged by more than 1% on Monday. European stock markets continued the upward momentum on Tuesday, following the trend set in Asia. The often volatile China Shenzhen index was among the few global indexes to lose ground. Oil and precious metal prices dipped slightly.